Sunday, Monday, Happy Days! Tuesday, Wednesday, Happy Days! Man, I used to love watching the show Happy Days when I was growing up. 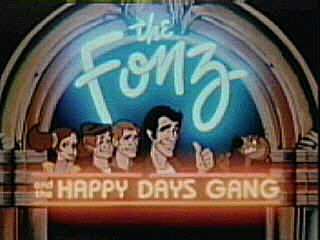 I loved Fonzi and his catchphrase, “Heeeeeeeeeeeeey!” I loved the show’s catchphrase, “Sit on it!” I loved the theme song, I loved the setting and the sets, I loved the other characters. It was just a lot of fun to watch. I still enjoy it. I DVR it every once in a while to see some of my favorite episodes. Just a few weeks ago I got an email from Ticketmaster letting me know that tickets for Happy Days the Musical, showing in Jacksonville, were only 20 bucks during the week. I didn’t realize there was a musical based on the TV show, but it’s not surprising considering the Broadway shows based on Saturday Night Fever, Xanadu, Road House and other movies from the ’70s and ’80s. I thought it would be fun to see how they managed to translate the show to the stage so I bought Steph and I tickets and we went this past Saturday. The show was very good. The guy who played Fonzie was spot on. He had the mannerisms and voice inflection down cold. The guy who played Ritchie was familiar to me because he was in the cast of Avenue Q which I happened to see on Broadway in 2004 right before it won the Tony for Best Musical. Overall, the musical was like watching an episode of the TV show, cheesy and cute. The songs were fun, too. Steph and I really enjoyed watching it. If it comes to your town, and you loved the TV show, then give the musical a chance. I think you’ll like it. 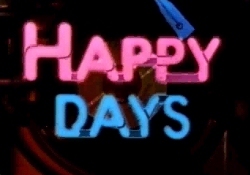 Anywho, after watching the musical, I started Googling Happy Days. I was surprised how much info and trivia was out there. I was reading for like 3 hours about behind the scenes information and background info on the show and characters. I enjoyed it so much that I thought I would pass along some of my favorite tidbits. So, without further adieu, here’s everything cool about the show Happy Days that you never knew. * Originally there were three Cunningham children. Ritchie, Joanie and the eldest, Chuck. Chuck Cunningham was phased out of the show in Season 2 (off to college for basketball). Nowadays, when I watch a cartoon, I think, “There’s a 30min commercial for toys…or a video game.” But back when I was a kid, things seemed different. They may not have been different, but it seems to me that I had a larger variety of cartoons to watch. It wasn’t just toy lines and video game sales that seemed to drive the creation of a Saturday morning cartoon, it was how popular the property was. Not just in toy aisles, but on TV or at the movies. The ’70s and ’80s were a boon for TV and movie properties to be translated into cartoon format. Not only that, but popular music groups would be translated into cartoons for kids. Some made the transition naturally, some turned out like, “Wha-huh?”. Regardless of quality, these types of cartoons fascinate me. Let’s take a look at some of the cartoons that were created from a live-action tv show or movie. This is by no means a comprehensive list, these are just the ones I can remember, but if you have any others that you remember, leave a comment about them. 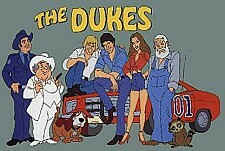 The Dukes – Based on Dukes of Hazard, this cartoon featured the voices of the entire live action show’s cast. In the first season, however, Vance and Coy, two other Duke cousins, were used. Bo and Luke would arrive for the second season (yes, there was a second season). The premise was very similar to Wacky Races in that the Duke Boys were participating in a big car race against their arch foes Boss Hogg and Roscoe P Coltrane for the mortgage on the farm. Check out the intro on YouTube. The Brady Kids – Based on the Brady Bunch, this featured the kids (no Mike or Carol) as a touring band a la The Beatles. All the kids lent their voices in season 1 but Barry Williams (Greg) dropped out in season 2. Suprisingly, there was an appearance by Superman, Lois Lane and Wonder Woman in one of the episodes making this series a copyright nightmare for release on DVD. Gilligan’s Planet – There were actually two Gilligan’s Island cartoons. The first was in 1973, and then this one, in 1982. The Professor managed to build an interstellar rocket that propels our castaways into space to crash land on an uncharted planet. In essence, perpetuating the cycle (Professor, just fix the damn boat!). All the show’s cast lent voices except Tina Louise (Ginger) who was replaced by Dawn Wells (Mary-Ann). Check out the intro on YouTube. 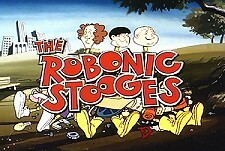 The Robonic Stooges – There was a 3 Stooges cartoon in the ’60s, but the Stooges were re-imagined as bumbling superheroes in this 1978 cartoon. The three stooges all have various bionic enhancements that they use to varying degrees of success to solve crimes. Scripts for this cartoon were written by Moe Howard’s son-in-law. 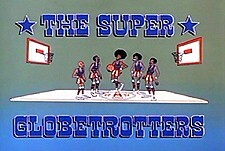 The Super Globetrotters – A lot of people know about the Globetrotters’ appearances on Scooby-Doo, and that they had their own show called the Go-Go-Globetrotters. But this beauty debuted in 1979 and was another take on bumbling superheroes like the Robonic Stooges above. Each globetrotter had a weird superpower that helped them solve crimes and rescue people. This was one of my favorites. Check out the intro on YouTube here. 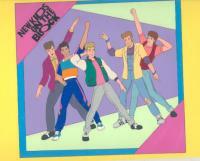 New Kids on the Block – Yes, in 1990, at the height of their popularity, there was a New Kids on the Block cartoon. I remember catching it on tv a few times. Pretty standard stuff. None of the New Kids did the cartoon voices, however they filmed live action intro scenes to be cut into the show. Check out the cheezy ’80s-like intro on YouTube. Teen Wolf – 1986. This was one of my absolute favorite cartoons while growing up. I loved the original movie this was based on and the cartoon was a lot of fun. None of the movie cast returned for the cartoon but the stories were a lot of fun. It helps that I love almost anything to do with werewolves. Check out the intro on YouTube where Teen Wolf jams to a cassette Walkman!!. Alf – The voice behind Alf returned for the Animated Series which was a prequel to the tv show. It followed Alf and his friends on Melmac before he would crash land on Earth in the tv series. 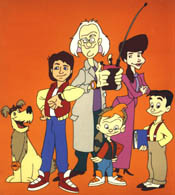 Back to the Future: The Animated Series – 1991. Everyone who reads this blog knows I love Back to the Future. However, I never really could get into this cartoon. I think because the stories/scripts were all over the place made it tough to like. It could also be that I was going to graduate high school right when this came out and I didn’t watch as much cartoons. Christopher Lloyd, Mary Steenburgen and Tom Wilson all returned to their roles of Doc, Clara and Biff, respectively. Beetlejuice – This was actually a very good adaptation of the 1988 Michael Keaton Beetlejuice movie. Premiering in 1989, it followed the many misadventures of Beetlejuice and Lydia Deetz. 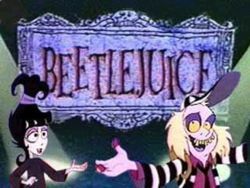 The premise of the movie was changed slightly as Lydia and Beetlejuice are best friends in the cartoon and the main characters of the Maitlands in the movie don’t even appear. Very funny and very cool character design. Check out the intro on YouTube. 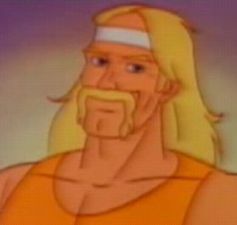 Hulk Hogan’s Rock ‘n Wrestling – Awesome 1985 cartoon featuring many popular WWF wrestling characters. Very good cartoon, with lots of rock, but, ironically, very little (if any) wrestling. None of the wrestlers provided their own voices, but there were live-action segments which featured the real guys. As a matter of fact, Brad Garrett (Robert on Everybody Loves Raymond) would provide the voice for Hulk Hogan. Check out the rockin’ intro with Hulk Hogan walking down the streets of Manhattan. 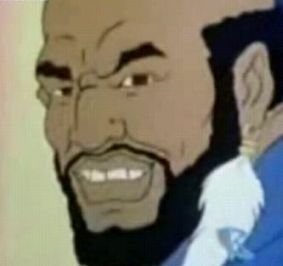 Mr. T – 1983. Seeing Mr. T as the coach of a high school gymnastics team seems perfectly—-wait, Wha-?! See the intro on YouTube. The Real Ghostbusters – I talked about this cartoon in an earlier article. 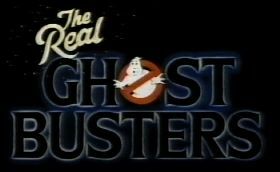 Based on the hit 1984 movie, this cartoon, debuting in 1986, would follow the further adventures of the four ghostbusters and would add the help of Slimer, a ghost. None of the movie cast provided voices, however Winston Zedmore was voiced by Arsenio Hall. Going hand-in-hand with this is the Ghost Busters cartoon which was based on the 1960’s tv series. Did you guys know that, Happy Days, being one of the most popular tv series ever, spun off at least three different shows; Joannie Loves Chachi, Laverne & Shirley and Mork & Mindy. Those are just the live-action shows. It also gave birth to three cartoon shows. Here they are. The Fonz and the Happy Days Gang – 1980. 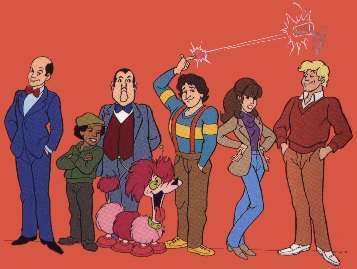 Henry Winkler (Fonz), Ron Howard (Ritchie) and Donny Most (Ralph) all provided their voices for this show. It had a great premise where our 3 heroes were stranded in a time machine with a futuristic chick named Cupcake (really?!) trying to find their way back to 1957. Check out the intro on YouTube. 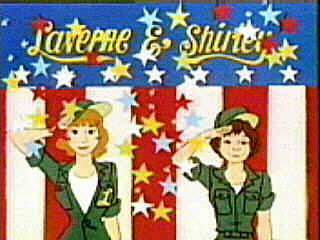 Laverne and Shirley in the Army- Penny Marshall and Cindy Williams lended their voices to this 1981 cartoon featuring titular characters Laverne & Shirley and their adventures after having joined the Army. Ron Palillo (Horseshack) provided the voice of their pet pig, Sgt Squealy. They would later be joined by Fonzie and his dog, Mr. Cool, as motor pool mechanics. Check out the intro on YouTube. Mork & Mindy – In 1982 Robin Williams and Pam Dawber lent their voices to this cartoon about Mork enrolling in high school under orders from Orson. These are all cartoons I was able to catch on TV a few times while flipping the channels oh those many Saturday mornings ago. Can you imagine studios doing this today? What shows could be made into cartoons? Could 24 or Alias be made into a cartoon? How about Friends or The Office? Seems crazy now, but back then it was commonplace. There are many other live action shows that were turned into cartoons, can you name a few? Some sites that were indispensable to me for research were Wikipedia, IMDb, Big Cartoon Database and Toon Tracker. 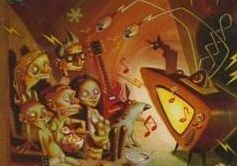 Check them out for some really cool images and history to some really great cartoon shows.